Only a couple of hours after posting my 2nd ever blog post here, my rant about the iPhone, some guy from WOMWorld Nokia in the UK contacted me, and asked if I’d like to try out their Nokia N900 for 2 weeks. Umm, OK! I’ll be honest: I hadn’t heard of this phone before. I keep an eye on the tech blogs but I really only pay attention to iPhone, Android and Windows Mobile 7 news. But a quick glance at the Nokia UK website told me that the N900 is their top of the line smartphone. Like every other phone on the planet (bar one), it has an SMS length counter. Yay! It feels like a phone, with its removable battery. It has a physical QWERTY keyboard. You can run multiple apps at the same time. Its web browser is great, with accurate rendering of the sites I looked at and Flash support. Removable upgradeable microSD cards. My brother had a play with it – he doesn’t have a smartphone, and he thought it was much easier to use than my iPhone. I didn’t like the build quality, it felt too plasticy. I didn’t like the resistive touchscreen, to me it felt like I had to thump it harder than I’d like to. And it wasn’t precise either, sometimes I’d click the wrong link while browsing web pages. It comes with a stylus but I kept forgetting to use that, and who wants to use a stylus anyway. The OS occasionally felt slow and not as snappy as the iPhone 3GS. It was stuck in landscape mode – no portrait mode here folks, except when making a call. I couldn’t figure out the software suite for Windows at all. I wasn’t sure which package to download from the Nokia website, so I tried "Nokia PC suite", and that was crap. I couldn’t figure out how to load music onto the phone at all so I couldn’t try out its media abilities. The maps application was nowhere near as slick as Maps on the iPhone. A note about the keyboard: I always moan about the iPhone’s on screen keyboard so I thought I would love the N900s physical keyboard, but it seems like I must have gotten used to the iPhone’s keyboard because I can type twice as fast on the iPhone than on the N900. 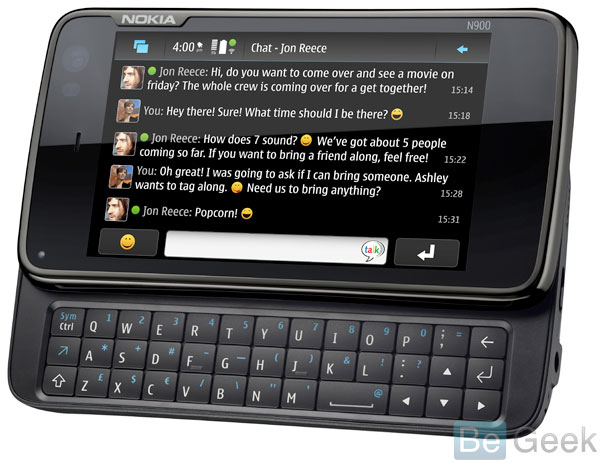 So on paper, the N900 wins hands down – removable battery, physical keyboard, upgradeable storage, multitasking and Flash support. The iPhone is slimmer though which makes it better looking. If you don’t already have an iPhone then the N900 is a real contender. However, the iPhone, for all it’s weaknesses, offers a slicker overall experience, and looks way cooler even if every man and his dog has one these days. A phone has to look bling after all. And the iPhone wins because it is so much more snappy and responsive. I was happy to send the N900 back and go back to my iPhone.